Did you ever wish you knew the secret to bouncing back from life's toughest roadblocks, wounds, and obstacles? According to psychotherapist, international mindfulness teacher, and former Buddhist monk Donald Altman, there is no secret. There is simply the skill of applying mindfulness to whatever new problem knocks on your door each day. It works because mindfulness rewires your brain and dramatically changes your relationship to the problem. The 101 mindfulness 'tools' in this book will give you newfound hope, optimism, and strength. These are simple, yet powerful mindfulness practices that you can apply in just a minute or two -- whether you're facing something extremely annoying or seemingly insurmountable. Those you know may think you've found a secret elixir to wash away your problems. But you'll know the secret is just retraining your brain with 101 Mindful Ways to Build Resilience. Stay Mindful & Color is a pioneering coloring book like no other. Integrating easy-to-use, life-enhancing coping skills with beautifully detailed and illustrative drawings that visually reinforce each mindfulness practice. Mindfulness has been shown to effectively manage stress and emotional reactivity, as well as reduce symptoms related to anxiety, depression, and pain. So if your mental hard drive has ever “crashed,” let Stay Mindful & Color reboot and rewire your brain, one centering, soothing practice and joyfully optimistic drawing at a time. Donald Altman, M.A., LPC, is a psychotherapist, award-winning writer, former Buddhist monk, teacher and an adjunct professor at Lewis and Clark Graduate School of Education and Counseling. He is also a faculty member of the Interpersonal Neurobiology program at Portland State University and teaches various classes blending mindfulness and Interpersonal Neurobiology. A prolific writer whose career spans more than 25 years, Donald has authored several pioneering books on mindfulness, beginning with his 1998 Art of the Inner Meal. (HarperOne, 1999). 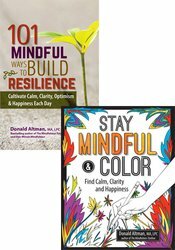 His book, The Mindfulness Code (New World Library, 2010) was named as “One of the Best Spiritual Books of 2010.” He has also authored The Mindfulness Toolbox for Relationships: 50 Practical Tips, Tools & Handouts for Building Compassionate Connections (PESI, 2018), Stay Mindful & Color: Find Calm, Clarity and Happiness (PESI, 2016), Meal By Meal (New World Library, 2004), Living Kindness (Moon Lake Media, 2009), One Minute Mindfulness (New World Library, 2011), The Joy Compass (New Harbinger, 2012), The Mindfulness Toolbox: 50 Practical Tips, Tools & Handouts for Anxiety, Depression, Stress & Pain (PESI, 2014) and, 101 Mindful Ways to Build Resilience: Cultivate Calm, Clarity, Optimism & Happiness Each Day (PESI, 2015). In addition to his books, Donald was a staff writer for an EMMY-Award winning children’s television show (“The Magic Door”, CBS Chicago), won an American Medical Writer’s Association award, co-created the first interactive comic strip on America Online, and has had articles appear in New Age Journal, the Los Angeles Times, and Independent Business Magazine, among others. Donald reaches out to the professional community by serving as the vice president of The Center for Mindful Eating. Donald works extensively with mindful meditation in his own life, as well as offering these tools to others through his books and classes. He teaches mindfulness and spiritual values around the country. He is dedicated to bringing these ancient practices in tune with modern living and to invite wellness into our stress-filled lives. Donald is also a member of the Burma Buddhist Association. An avid motorcyclist, he enjoys riding his motorcycle along the beautiful Oregon coast. Speaker Disclosures: Financial: Donald Altman is in private practice. He is an Adjunct Faculty member of the Interpersonal Neurobiology Program at Portland State University. Mr. Altman receives a speaking honorarium from PESI, Inc. Non-financial: Donald Altman has no relevant non-financial relationship to disclose. "Delightful, Wise. Practical. Altman immediately brings the reader into a mindful moment. He makes the cultivation of calm, clarity, optimism and happiness not only doable but inviting -- and it's one minute at a time. Nurture resilience and joy not by blocking whatever may be difficult but through acknowledgment, acceptance and appreciation. This book helps us remember that where we place our attention makes a difference. It empowers us to build resilience every day." Elana Rosenbaum, MS, MSW, BCD, pioneer teacher of Mindfulness-Based Stress Reduction, psychotherapist and speaker, Author of Being Well (even when you're sick): Mindfulness Practices and Here for Now: Living Well with Cancer Through Mindfulness. "Donald Altman's 101 Mindful Ways to Build Resilience is the essential resilience toolkit for business leaders or anyone wanting bold and practical methods for turning obstacles into success. This book provides real-world advice about how to turn self-doubt and negative thinking into affirmation of one's own abilities. It is filled with innovative and engaging mindfulness methods for enhancing people skills and building resiliency. Whether reinvigorating your career or striving for excellence, this must-read book will enhance your attitude and life with greater clarity, confidence, and optimism! I highly recommend it!" John Baldoni, author of bestselling MOXIE: The Secret to Bold and Gutsy Leadership and Lead with Purpose. "Each minute-long chapter will help you create that special mindful space to enrich not only the rest of your day, but the rest of your life."